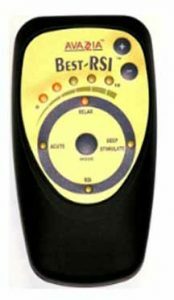 The BEST-RSI™ device offers stronger, output microcurrent, electro-stimulation for deeper penetrating, faster, longer lasting pain relief for more serious acute or chronic conditions. The Avazzia BEST-RSI device has 4 modes, uses 2 AA 1.5V batteries, and has an accessory port for attaching lead wires and pads or electrode accessories. The BEST™ line of products are hand-held, battery-operated, electro-stimulation medical devices. 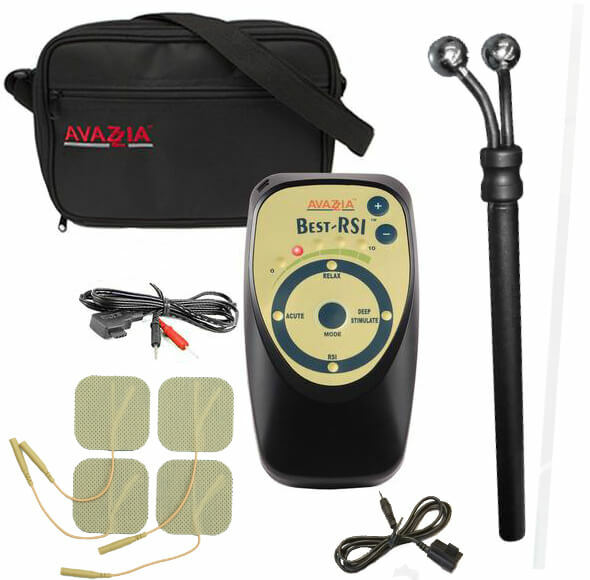 The Avazzia BEST-RSI is designed for at-home or clinical use and offers easy-to-use features including four popular frequencies to allow patients to administer microcurrent pain relief at home or healthcare providers to administer powerful microcurrent treatment in the office. Avazzia BEST technology uses unique output waveforms and frequencies and treatment will not be accommodated by the body. The microcurrent treatment may be administered using the onboard electrodes on the unit’s back or with accessories (purchased separately). Research has shown microcurrent offers long-term pain relief without drugs or surgery. It is not habit-forming and non-addictive. Free online instructional videos are available at www.AvazziaTraining.com.